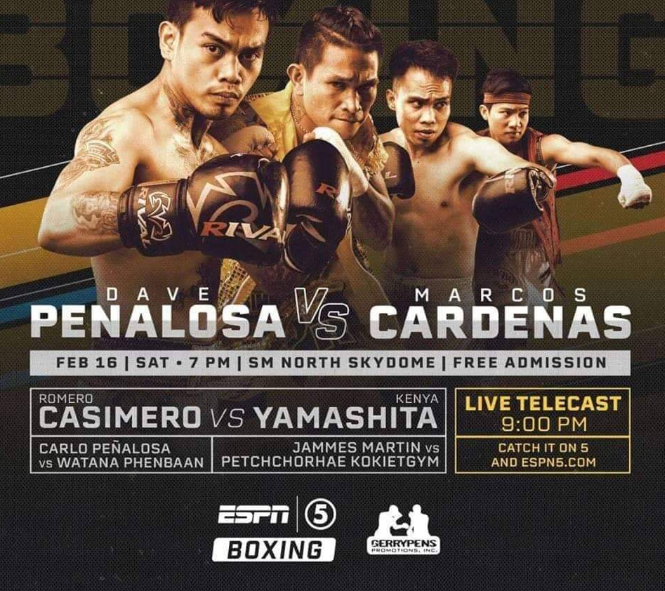 MANILA, Philippines – The Peñalosa ghting legend continues as its next generation climbs the ring on ESPN5 Saturday February 16 at Midas Hotel & Casino in Metro Manila. In the televised main event, “The Hunter” Dave Peñalosa (14-0,10 KO’s), son of former 2-division world champion Dodie Boy Peñalosa, risks it all by taking on more-experienced, hard-hitting brawler “Geraldito” Marcos Cárdenas (19-6-1, 15 KO’s) of Sonora, México, for the vacant WBO Oriental Featherweight Belt, and a place in the WBO 126-pound world-rankings. A tactical southpaw as his old man, Dave faces his toughest opponent yet in the taller Cárdenas, a step up in class that tests the determination, boxing skills and punching power of the promising Filipino fighter whose father and uncle have been two-division champions of the world.